Benjamin Pavard's sensational volley against Argentina has been voted the World Cup's goal of the tournament, FIFA has announced. The full-back's sweet strike with the outside of his right boot into the top-left corner had goalkeeper Franco Armani grasping at thin air as France levelled the thrilling last-16 encounter at 2-2 shortly before the hour. Kylian Mbappe's quickfire brace set Les Bleus on their way to a 4-3 victory and eventual glory in the final over Croatia, but it was Pavard's stunning effort that endured as the lasting memory of that run to lifting the trophy in Moscow. Cristiano Ronaldo, Philippe Coutinho, Nacho Fernandez and Jesse Lingard all netted with spectacular efforts during the finals, but Pavard's glorious volley - best viewed via slow-motion replay from an angle directly behind the defender - was voted as the best of the lot by fans from around the globe. "The ball bounced up as it came to me. I didn't even think about it. 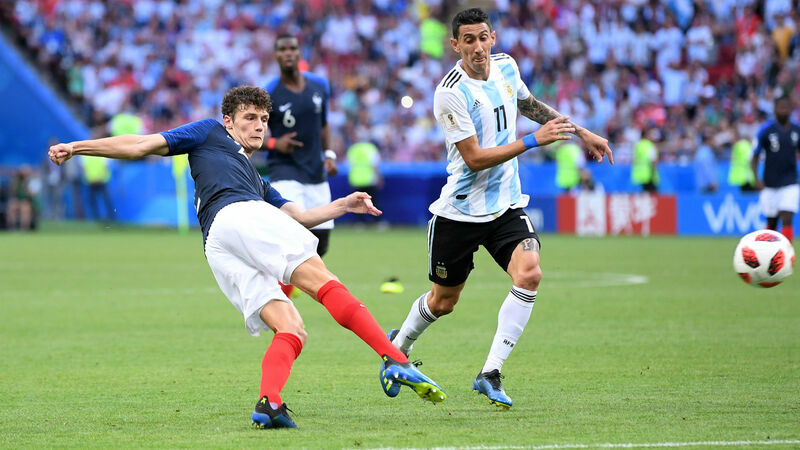 I just tried to get over it and keep it down," Pavard told FIFA.com after the clash in Kazan. "I was trying to hit it in the direction it came from, which is what the strikers always tell me. I didn't think it over, and when it went in I just felt so happy." Pavard's performances in Russia have seen him linked to a move away from Stuttgart, with Bundesliga champions Bayern Munich said to be interested in taking the 22-year-old to the Allianz Arena.